Just how early is spring this year? 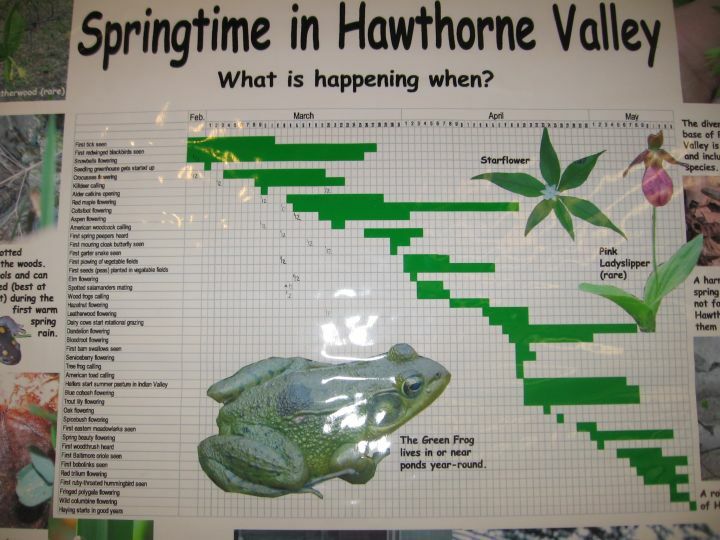 This poster in the Hawthorne Valley Farm Store shows the range of dates (green bars) when a long list of spring events have been observed during the last ten years. This year’s dates are marked with a ’12 in the respective date cell. We invite you all to contribute observations of “first sightings” either on the sign-up sheet under the poster in the store, or by e-mail (fep@hawthornevalleyfarm.org) or phone (518) 672-7994. Woodfrogs and mole salamanders, our flagship vernal pool breeding amphibians, began breeding during that same balmy night, on March 13 (during the last 10 years, we never saw them breeding before the first week of April, which makes them 3 weeks early!). 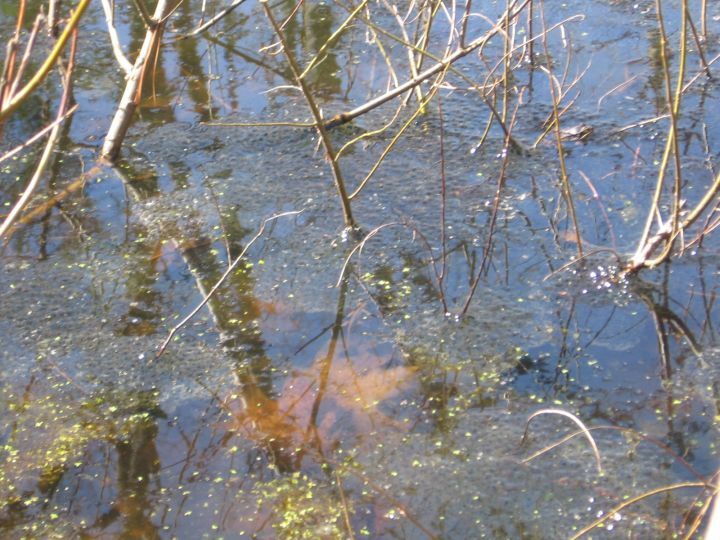 Now, a week after the breeding began, the vernal pools on Phudd Hill (and doubtless throughout Columbia County) contain woodfrog egg masses (on the left in picture below), as well as mole salamander egg clusters (on the right in picture below). Mole salamander egg clusters tend to be rather compact, cylindrical in shape and firmly attached to vegetation or dead branches under the water. Our most common mole salamanders (so called because they spend most of their life in the earth) are spotted and Jefferson salamanders. The salamander egg cluster on the right in the picture above is most likely from a Jefferson salamander. This rare species tends to lay smaller clusters with more sterile eggs (big white globules). Live embryos are dark colored. The three pictures below show typical egg clusters of the somewhat more common spotted salamander. 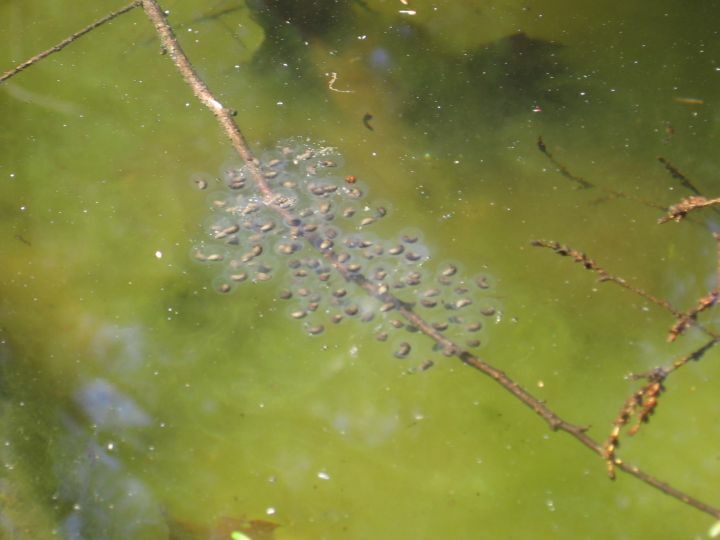 In contrast, woodfrog egg clusters float on the water surface and tend to accumulate along the lee shore or around shrubs or branches emerging from the water (photo below). Woodfrogs are usually brown and sport a characteristic dark brown patch behind the eyes. 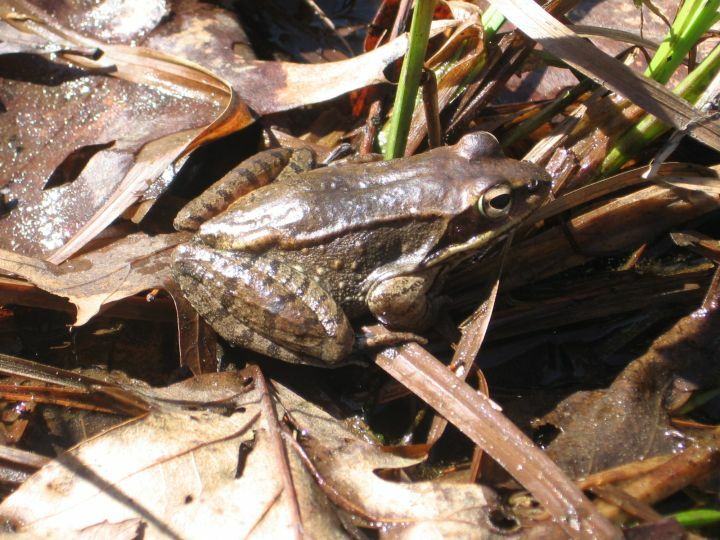 Other than the more common green and bull frogs, who live year-round in or near water, the woodfrogs spend most of their life in the wooded uplands. They overwinter not in mud (like the bull and green frogs), but outside of the water, where they allow themselves to completely freeze. 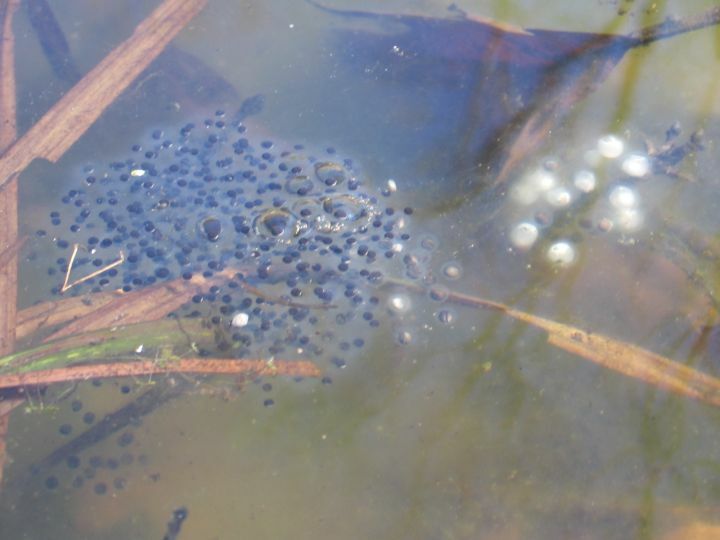 However, the first warm spring rain calls them to the vernal pools (small woodland pools that usually dry out during the late summer) where they mate and lay their eggs. Their chorus sounds like a flock of ducks! A woodfrog resting on the shore of a vernal pool. The mole salamanders (sorry, no pictures from this outing…) have a similar lifestyle: adults live in the woods, reproduction depends on vernal pools and happens very early in spring. 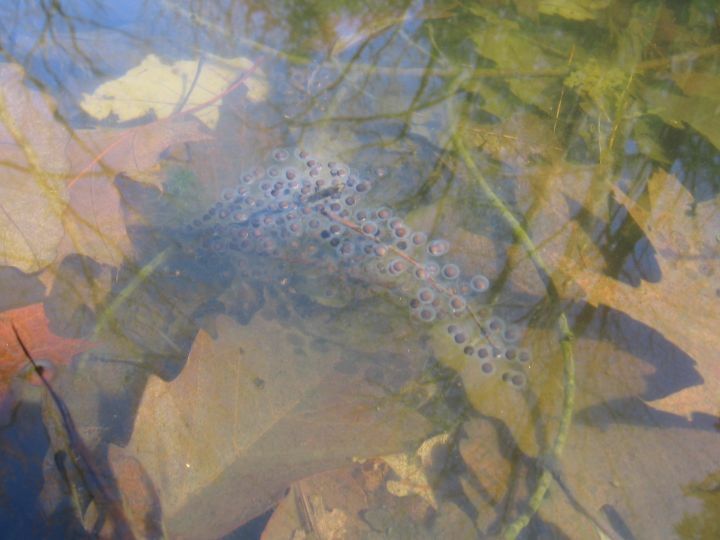 Woodfrogs and spotted salamanders often begin breeding when the ponds are still covered with ice. Not this year! 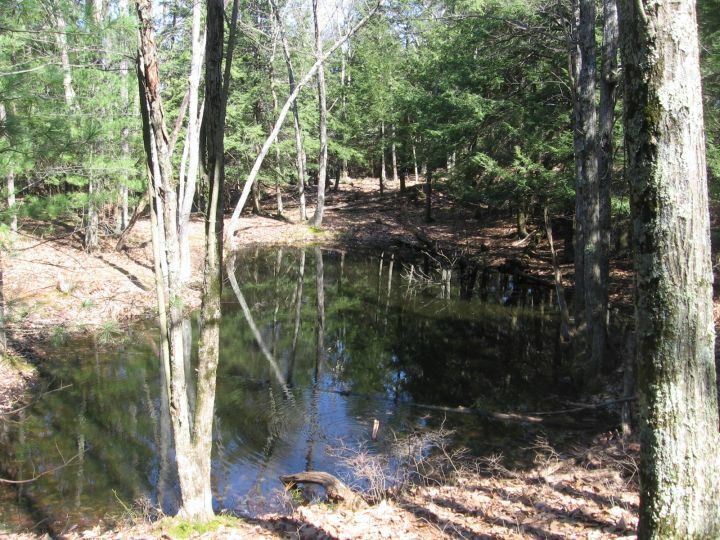 A vernal pool, surrounded by undisturbed forest, provides excellent breeding habitat for woodfrogs and mole salamanders. 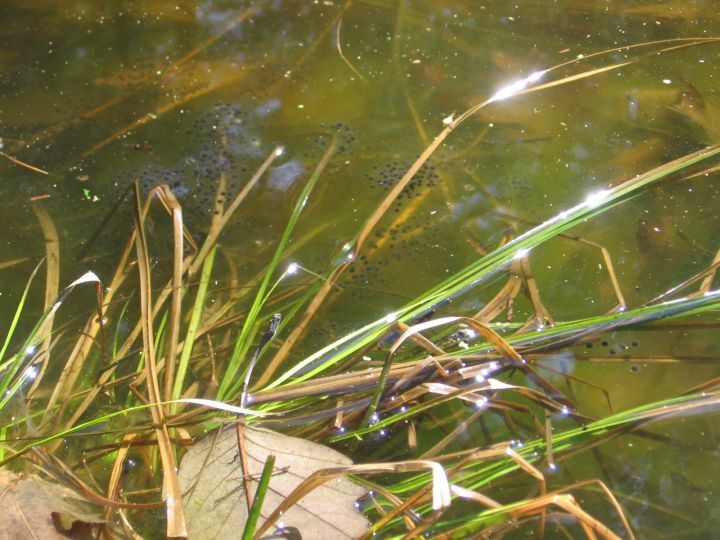 The young woodfrogs and salamanders are now in a race to hatch their tadpoles and to develop into terrestrial forms before the water in their pools dries up. Let’s hope that the Spring and early Summer are rainy enough to give this year’s generation time to mature. 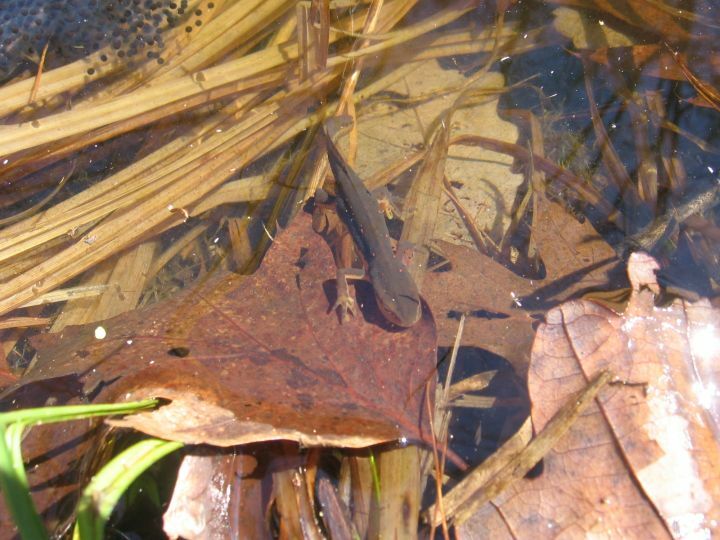 If a pond has not completely dried out for a few years, it might harbor another salamander, the aquatic and predatory red-spotted newt (see photo above), whose terrestrial teenage stage is the red eft. They are usually found not far from the egg clusters of woodfrogs and mole salamanders and are often seen to attempt eating them. When you take the time to observe their efforts, you will learn that it is not easy to get to the embryos through the bouncy, gelatinous layer that holds the eggs together, especially when the predator itself is afloat in the water…. Ponds that have not dried out in past years often also have big tadpoles of the aquatic green and bullfrog (they are huge right now, because they have overwintered and are in their second year), which also love to prey upon the eggs of woodfrogs and mole salamanders. If you happen to see a large salamander larva (to be recognized by their external gills which look like feathery appendices on the sides of their heads) in a vernal pool at this time of year, you’re probably seeing the young of the marbled salamander, our rarest mole salamander, which breeds in the fall. We would love to hear about any sightings, because we know of only one Columbia County location for this rare species. 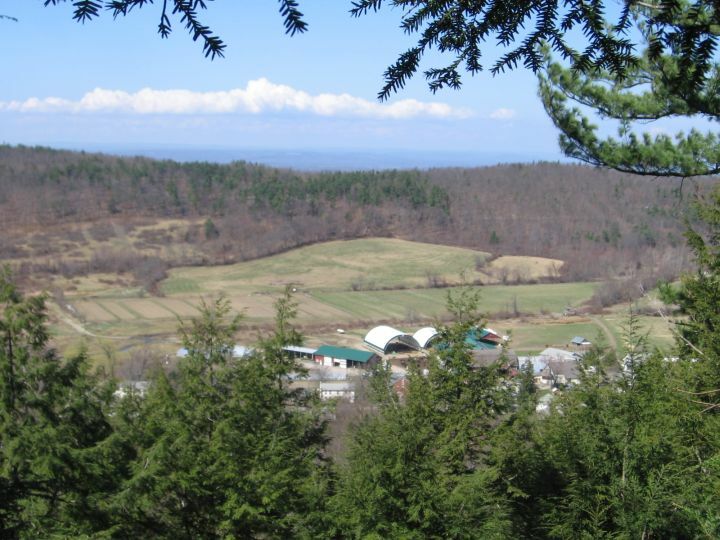 Right next to one of the vernal pools on Phudd Hill is “Indian Lookout”, where one can get a nice overview of Hawthorne Valley Farm. Note how the meadows are clearly beginning to turn green, again. Also, the farmers have taken advantage of the dry and warm days to plow the vegetable fields. Back down at the base of the hill near Ben Ocean’s bridge an old friend awaits us: the leatherwood (Dirca palustris). This little shrub is quite rare in Columbia County, but the patch right here at the base of Phudd Hill persists, in spite of occasional heavy browsing by deer. 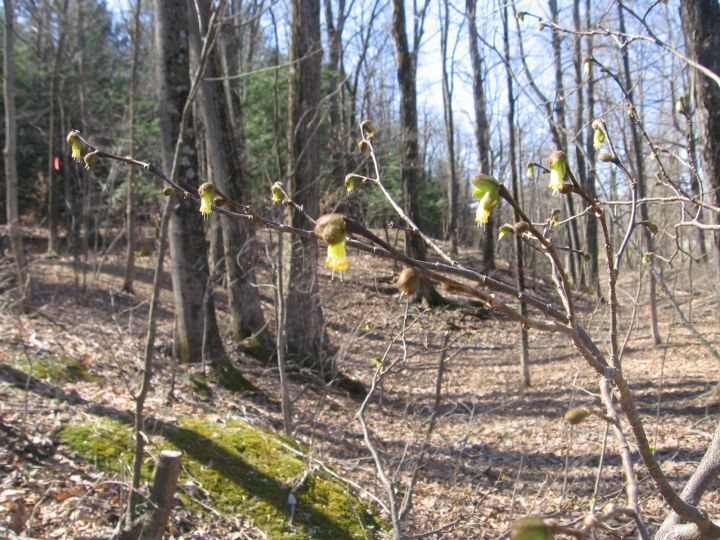 Its small, yellow flowers are among the earliest in the forest, way ahead of the spring ephemerals with whom it shares the stream-side habitat. 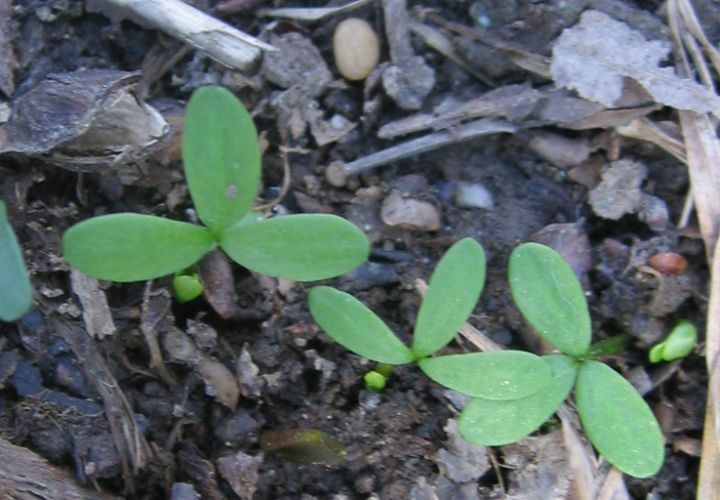 This small plant occurs exclusively on bare soil of floodplains and is considered rare in most New England states. Here in Hawthorne Valley, we seem to have a healthy and persistent population along the Agawamuck, the creek behind the school. 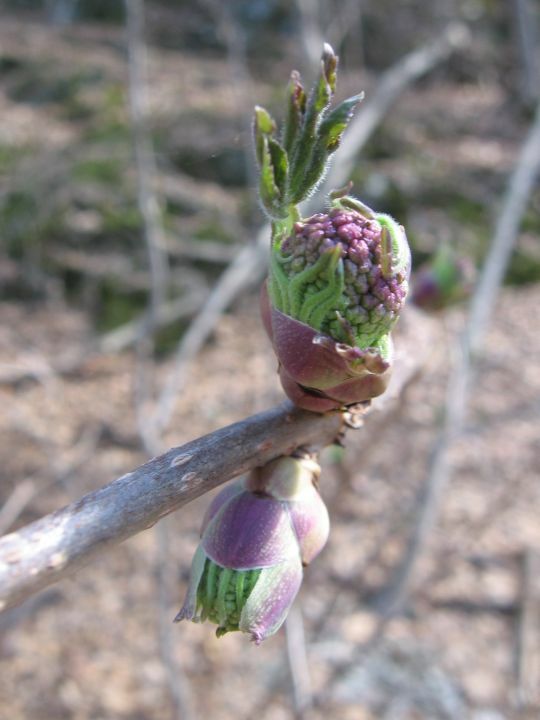 These are elderberry buds in the process of opening (picture above). 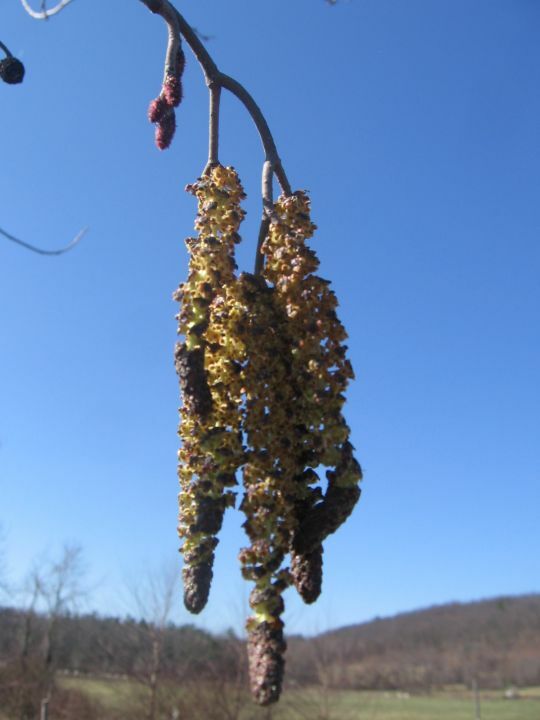 Along the farm creek, alder displays its male flowers in yellowish catkins at the tips of branches, while the small, red, cone-like female flowers are located on the branch just above. 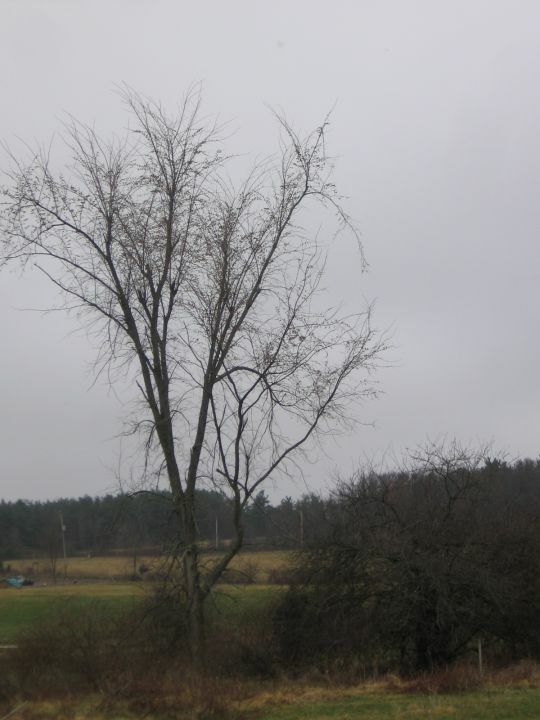 The elm branches, twigs, and flowers (above) are alternate, resulting in a somewhat zig-zag pattern. 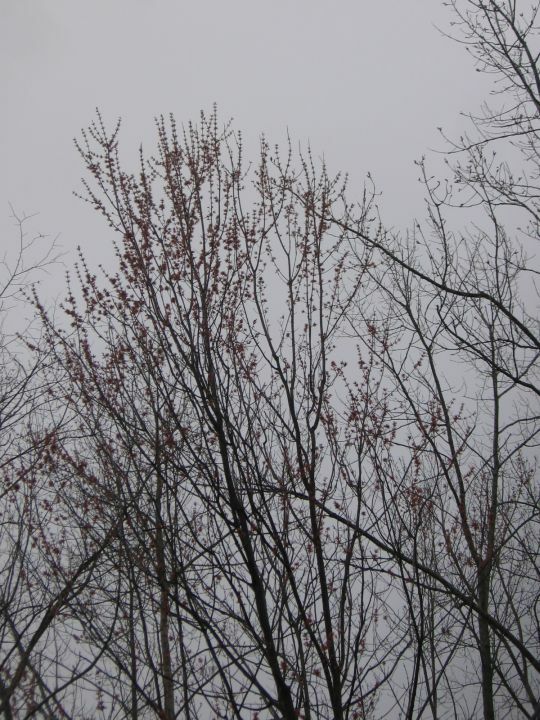 In contrast, red maple (below) has a very opposite pattern to its branches and flowers. 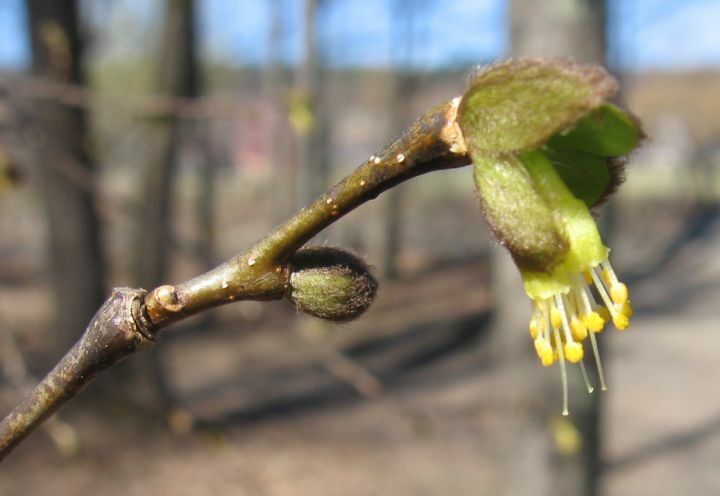 Maple flowers are unisexual, containing either stamens (male flower parts) or pistils (female flower parts), although in most species they do occur on the same tree. 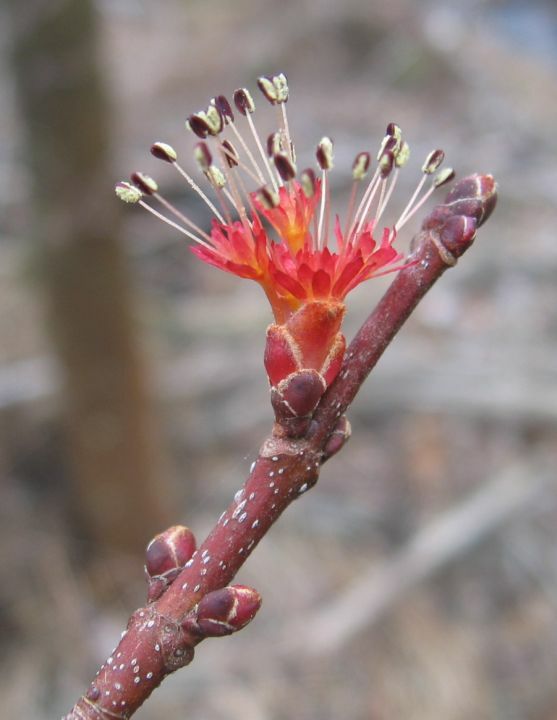 In red maple, both male and female flowers are red and give a reddish hue to the flowering canopy. Below is a close-up of a cluster of male red maple flowers.